Did you finally take the leap and buy a sous vide machine, but don’t want to spend hundreds of dollars on a vacuum sealer? Are you trying to figure out how to fully submerge your food in the bath without it persistently floating to the surface? Well I’ve got an incredibly easy and affordable solution for you. 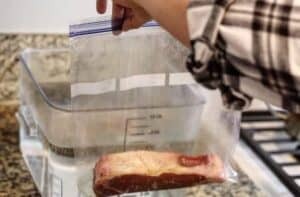 The water displacement method – your golden ticket to cooking sous vide without having to invest in a fancy vacuum sealer. 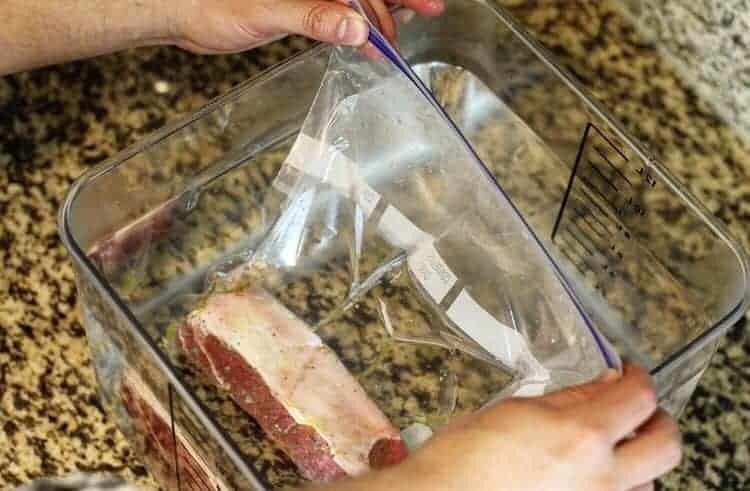 The Displacement Method is a technique where you first place your food and marinades in a Ziploc double zipper, freezer bag. Note that using this specific type of bag is recommended, as they are BPA and dioxin-free, and durable enough to endure lengthy cooks. Next, submerge your food in a container of water, and allow the pressure to force all the air out of the bag. Last, seal the bag up and bam, that’s all there is to it! Now enjoy all the brilliance of cooking sous vide without having to break the bank buying all the extra equipment. Place your food (including fresh herbs, olive oil and/or marinades) in a double zipper, freezer bag. Zip up 80% of the bag, only leaving one corner unzipped. Fill container or pot with enough water to fully submerge the freezer bag. Place the bag in the water, gently massaging out any air pockets surrounding the food. The pressure of the water will force all the air out of the bag as you continue to submerge the bag. Once the water level is just below the zip-line, seal the rest of the bag. Ensure that the bag is fully zipped so that no water can enter during the cook.